Getting around is a key part of any world and in India this is truly a unique experience. The first mode is walking, as we and the Indians have progressed past the crawling stage. 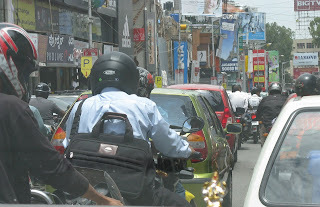 Traffic in India, however, has not yet progressed past this crawling stage in many cases. Walking would seem to be pretty simple: lift your right leg and place it in front of the left. Transfer weight, and repeat with alternating legs and enjoy the world passing by. Not so fast though. First of all in India, one must make careful navigation of the terra firma. The first priority is to dodge the ubiquitous cow pies. Apparently it is good luck to have stepped in one, but our guide confirms it is better luck to avoid them. Then there are the remnants of similar “movements” of dogs that roam the streets in India. Garbage is pretty widespread in most locations and that also needs to be avoided. Looking down, there are cracks, potholes, missing tiles and holes in the sidewalks, roads and pathways. Some of these are from the aging walkways, many of which are centuries old! Some are from construction, which seems to be consuming every inch of Bangalore. And some are just from wear and tear. Ok, so now you are placing legs in front of each other, navigating the terra firma and you decide to look up a little. There is a clue in the cow pie discovery; low and behold there are cows at every turn. They believe they own the place and sit, walk and do what cows do, with ‘The King of the Road’ as their theme song. As you try to move past the cows, a crowd of people squeeze past, stand around or push forward. All of this must be anticipated and avoided. There is also a low regard of personal space and people are quite comfortable being glued to your back. They confidently stride forward, sweeping you along. Just when you have this down, a motorcycle whizzes past, then an auto rickshaw, then a car and there is yet another thing to be aware of and beware of! All these vehicles are constantly beeping their horns. It becomes as much an experience of sound as it is sight. The motorcycles are everywhere. In small laneways that are 3 people wide, you hear the beep of a motorcycle horn and you gain the instinct to quickly move to the side because the bike certainly doesn't move aside as it passes by you. Ok, so terra firma covered, dodging motorcycles and people covered, and you inevitably need to cross the street. Look to the left, take a step and OOPS they drive on the left here so you were supposed to look right to see oncoming traffic. Once that becomes habit you realize that driving rules are merely suggestions. In reality cars, motorcycles, auto rickshaws and trucks routinely drive on the wrong side of the road, moving in the wrong direction. Add this to the sheer volume of vehicles and one has a veritable maze of hardware to negotiate. Lastly, there are all of the sights you want to see. Stores and stalls selling all possible goods and food, people in interesting clothing, buildings that are gorgeous and ill kept (often at the same time). There are smells of cooking and of those pesky cows and their by-products. By this point you are scanning the ground avoiding pitfalls, navigating people, vehicles, crowds, traffic, sights, sounds, smells and voila you are actually walking down the street and enjoying India up close. Your head is also spinning and we were literally left feeling dizzy at times in the early going. Now we are almost expert and have spent much time using our newly developed Indian style on foot. As you can tell, not all is a bed of roses. An auto rickshaw ran over Lynn's foot and broke her baby toe which is healing slowly. Other than all that, walking here is a breeze. Actually, there are a lot of expats with young children here. In some regards they say it is easier because you don't have to deal with new schools and leaving friends - they adapt well. As for the infrastructure here in Bangalore it is a bit of a mess. You would have to watch your young child carefully walking down the street as there are many things to look out for: holes, garbage etc. That being said there are malls and parks that would be easier to walk around. And the expat "communities" are gated and clean with few cars - nice for children to run around and play with other kids. Lastly, the Overseas Women's Club (OWC) has playgroups for young children and is a great way to meet others just like you! As for the poverty...there is very little begging here in Bangalore compared to other cities. There are all types of housing situations and you will walk/drive by them any time you go out: from real houses to apartments to one-room stone houses to tents and plastic tarps. I would not deter you from coming because you have young children. You do have to be prepared to be patient with the way of life here. Let me know if you have any other questions, hope this helps.